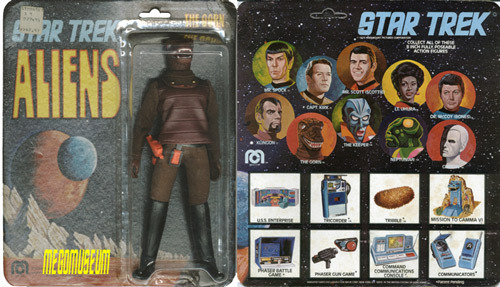 The Mego Gorn (Item No. 51203/3). This figure wins the booby prize for Most Embarrassing Attempt at a Star Trek Alien, hands-down (and with stiff competition like Talos and Mugato in the running, that's saying something!). The Gorn appeared in the episode "Arena," but he sure didn't look like this. The figure and the character each possess reptilian features, but that's where the resemblance ends. A real pioneer of Mego Reuse, in that it is the only figure in Mego's entire eight-inch arsenal that is assembled completely from RECYCLED PARTS. 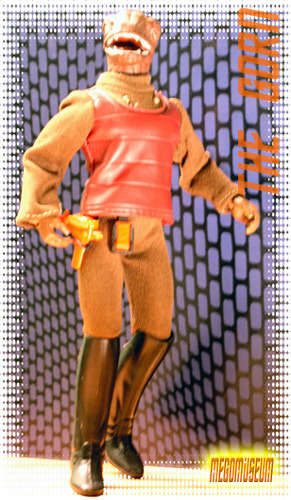 The head sculpt is just a WGSH Lizard head cast in brown rather than green (ironically, the Gorn was Green on the show), the body is a Soldier Ape Body (possibly recycling the bodies left over when the Apes TV show was cancelled), and the outfit and accessories are that of the Mego Klingon figure! You've got to have real guts to try and pass off an outfit from the SAME LINE as "new." 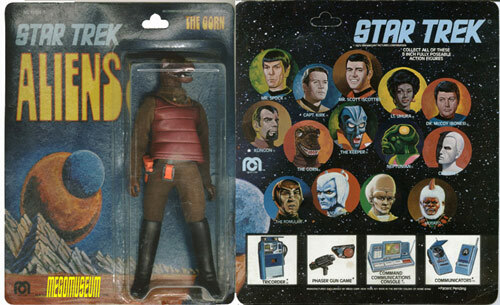 The Gorn figure also went through tunic variations, just as the Klingon did. 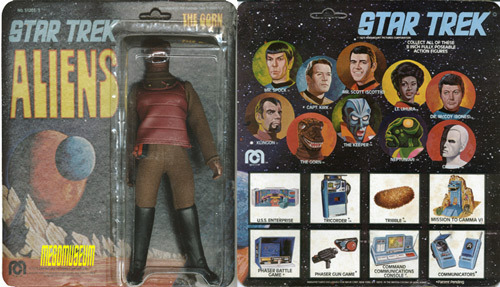 However, the Gorn has only been found with two of the three tunics associated with the Klingon. These variants appear to have no rhyme, reason or order, and seem to be based purely on whatever materials were available at the time of manufacture. The first was a tunic manufactured using a creamy-maroon vinyl with red lining on the interior (left). This HAS been found on a MOC Gorn. The second was a tunic manufactured using a brownish-maroon vinyl with red lining on the interior (right). This also HAS been found on a MOC Gorn. The third and final tunic was manufactured using a creamy-maroon vinyl with brown-gray lining on the interior. This HAS NOT YET been found on a MOC Gorn, but this does not mean that one does not exist. Logic suggests that there should be a Gorn out there, somewhere, wearing this tunic and still sealed to a card. Above we have a Gorn on a "10-back" card. This specimen is wearing the second tunic (brownish-maroon/red). Above we have a Gorn on a "10-back" card. This specimen is wearing the first tunic (creamy-maroon/red). Above we have a Gorn on a "14-back" card (considerably rarer than the "10-back"). This specimen is wearing the first tunic (creamy-maroon/red).